If you search short-term rental sites like Airbnb, HomeAway and VRBO, you’d be hard-pressed to find a city in California that doesn’t have at least one room for rent. But read through the municipal codes and you’ll see a different story. While some locales have moved to make a legal pathway for more short-term rentals to operate, others, like South Lake Tahoe, have voted to ban them almost entirely. The tumultuous state of regulations is apparent in four of the state's biggest tourism magnets: San Francisco, Santa Monica, South Lake Tahoe and Palm Springs. Each has worked to regulate short-term rentals in different ways, contributing to the patchwork of legislation we now see across the state. Hanging in the balance is the ever-present question over whether to regulate short-term rentals more strictly in an effort to preserve local culture, or allow them to thrive and reap the tax revenue as a result. Santa Monica passed its first home-sharing ordinance in 2015. As a city of 70 percent renters, it needed to protect local housing stock while also allowing residents to take advantage of new economic opportunities through home-sharing. Today, Santa Monica allows residents to rent out rooms in their homes for a period of 30 days or less. Renting out an entire home remains illegal. 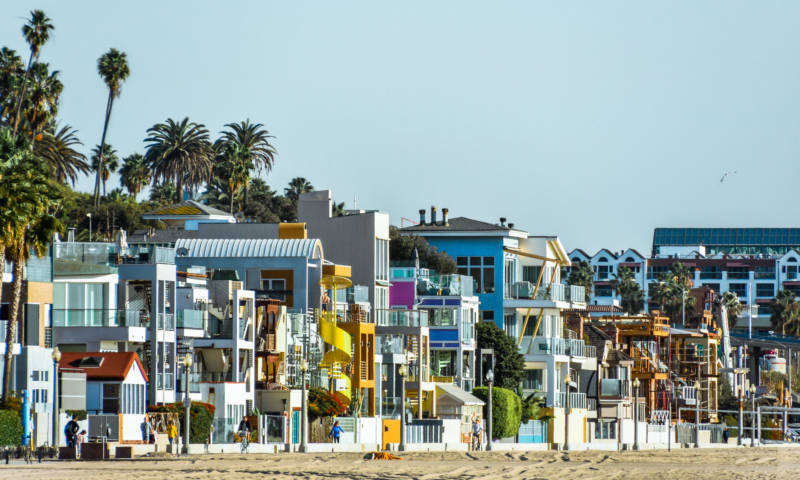 In 2016, Airbnb and HomeAway filed a lawsuit against the city to stop the home-sharing ordinance from taking effect, but in 2018 the U.S. District Court for the Central District of California ruled in favor of Santa Monica on the issue. San Francisco, for its part, didn’t start regulating short-term rentals until 2015. Up until then, short-term rentals were technically illegal, but the city didn’t enforce this until around 2011. “On the macro level, it’s about housing supply and housing affordability, and then on the neighborhood level, it's about making sure there’s regulations to help ensure quality of life for residents,” said Kevin Guy, director of the San Francisco Office of Short-Term Rentals. In 2014, in response to complaints from residents, legislation was passed to force hosts to register with the city. The new law also required hosts to live in their rentals at least part-time, and put a limit (90 days) on the number of nights a home could be rented out. Today, San Francisco maintains a list of all registered hosts, and works with Airbnb and VRBO to ensure hosts stay compliant. Compared to South Lake Tahoe and Santa Monica, however, San Francisco is still much friendlier toward short-term rentals, with longer limits on the number of nights hosts can rent out their rooms when they're not present, and no restrictions on renting out rooms when they are. Palm Springs, which has a long history of tourism, placed minor restrictions on short-term rentals in April 2017. Its Vacation Rental Ordinance No. 1918 states that hosts must have an in-person “meet and greet” with guests in the first 24 hours of their stay; it also instituted a complaint hotline. “The city has had to make adjustments so they can encourage the increased tourism, without sacrificing the quality of life for the people who reside here full-time,” a Vacation Rental staff member said. In June 2018, a ballot initiative called Measure C threatened to make short-term rentals in single-family residential zones illegal, but 70.06 percent of voters decided against it. Cities like Santa Monica and San Francisco can afford to regulate short-term rentals tightly, because they have income streams from industries other than tourism. That’s not as true in South Lake Tahoe, where a recent ballot measure to more or less ban short-term rentals could have far-reaching consequences. In December 2017, the city cracked down on short-term rentals, putting a cap on the number of permits that would be handed out, increasing fines and registration fees, and adding three enforcement officers to help keep the rental market in check. Before these changes could take effect, however, a group of residents put Measure T on the ballot, to make all short-term rentals in residential areas illegal (though full-time residents can still rent out their homes for a maximum of 30 days a year). When it passed by just 58 votes, it effectively made 1,400 short-term rentals in residential areas illegal overnight, though the decision is still being litigated. South Lake Tahoe’s enforcement officers are paid for through fines from short-term rental violations. If Measure T is implemented, those officers may lose their jobs, the city staff member said. While short-term rentals might be completely illegal, at least in residential areas, there could be no one to enforce the ban. Today, the future of short-term rentals is still uncertain, but it seems unlikely that they’ll ever totally go away. Even cities like Palo Alto, where short-term rentals are technically illegal, seem hesitant to enforce the regulations. That’s because many short-term rentals — both illegal and not — pay a transient occupancy tax. As that revenue becomes an established part of the city’s income, and as residents depend more and more on the money from renting out their rooms, more cities will likely be forced to strike a balance between letting short-term rentals operate, and regulating them in a sustainable way.